Base Elevation*: 0 to 2500 feet-- What is your garage elevation? Let us know by checking the corresponding button to the left. Float Gauge: Float Height Guage [Add $15.98]Simple and Effective accurately laser cut solution for measuring the CRITICAL float height! Accessories for Jetting Packages: UNIfilter filter oil, 16oz bottle [Add $8.98]UNIFILTER brand oil to maintain your prefilter, 16oz bottle. This is the Jetting, Pre-Filter AND FlexJet2 solution for the 950 Adventure, Super Enduro, Super Moto. Includes 2 specific length hoses to vent the carburetor bowls that replaces the Y. Requires OEM airbox to use the foam prefilter to replace OEM snorkel. Will not work for other applications. Idle Mixture Fuel screw (IMS) adjustments can be a time consuming project. Once installed, R&D Flex-Jet2 makes tuning a simple and easy project. With the Flex-Jet2, Idle Mixture adjustments are now at your fingertips! If you ride from your garage elevation up or down, across a pass or your favorite place to ride that is 3-4k feet different, proper tuning is now quick and easy! 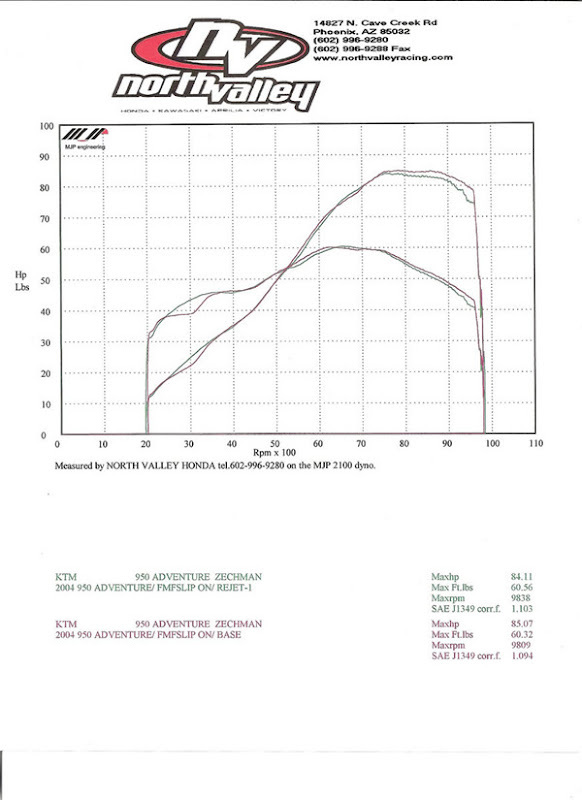 Independent review and dyno run of a customer: So, the purple graph is my 950 this morning, before the installation of the prefilter and jet kit. The carbs at this point are stock with the exception of the needles being in the third position. Bike is de-smogged and has FMF slip ons. The torque dip at 3000 RPM was no surprise and matched seat of the pants experience. The green graph is 4 hours later today, after completing the prefilter, jet kit, and carb cleaning. Apart from the included jets, no other modifications were made. Needles were retained in the third position. Maximum HP was reduced by 1 HP and max torque increased by 0.2 lb/ft. The increase and smoothing of the torque curve at 3000 RPM is very noticable while riding. previoiusly, and runs harder and smoother everywhere in the rev range. distance will tell, I plan to put 500 miles on the bike this weekend, but so far, I am truly impressed. a great product!